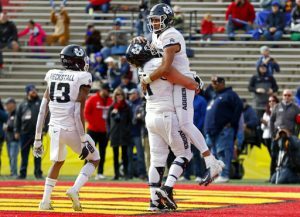 ALBUQUERQUE, N.M. — Utah State walked into the New Mexico Bowl with one of its best records in school history but uncertainty. Its head coach, Matt Wells, left to take the Texas Tech job. 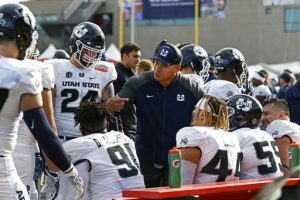 Interim coach Frank Maile had to prepare the Aggies with an army of graduate assistants and an announcement a new coach was coming next month. 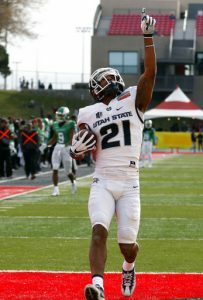 Love said receivers were able to get open, find space and get yards after the catch. “We’ve been doing that all season,” he said. 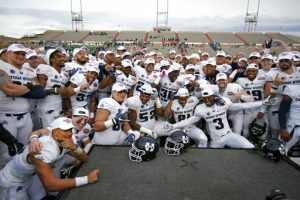 Littrell said Utah State was the best team the Mean Green faced all season. “We didn’t have enough in us today to make more plays to have success,” Littrell said. After the game, North Texas officials announced that Fine had a severe left strained hamstring. 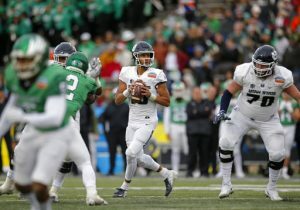 This is the second time in three years that Fine most of or all of the Mean Green’s bowl game after a shoulder injury kept him out of the 2016 Heart of Dallas Bowl. Littrell said Fine left with a “pretty bad” hamstring injury but couldn’t give more details. 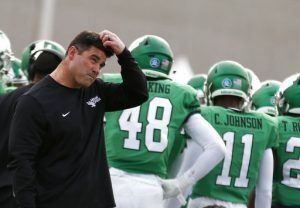 NORTH TEXAS: Fine is expected to return next season as quarterback for his senior year. Many of his favorite receiving targets also are expected to return and they won’t have to adjust to a new head coach after all.